Tunga penetrans is known as the chigger, jigger, chigoe, bicho do pé or sand flea. The head is angular, it has no comb of spines, and the thoracic segments are narrow at the top. This small pin-head-sized is found in sandy terrain of warm, dry climates. It prefers deserts, beaches, stables, stack farms, and the soils and dusts in and around farms. It hides in the crevices and hairy cracks found on the floors, walls of dwellings and items like furniture. It feeds on their warm blooded hosts including man, cats, dogs, rats, pigs, cattle and sheep. The female flea feeds by burrowing into the skin of its host. The abdomen becomes enormously enlarged between the second and third segments so that the flea forms a round sac with the shape and size of a pea. 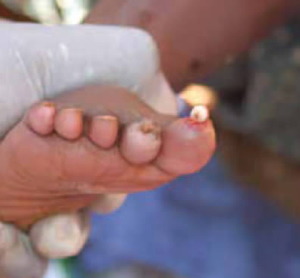 The impregnated female Tunga embeds itself in the skin under the toenails and fingernails of man - where the resultant sores may fill with pus and become infected. Others victims can be dogs, cats, rats, pigs, cattle and sheep. The first evidence of infestation by this sand flea is a tiny black dot on the skin at the point of penetration. Because the flea is a poor jumper, most lesions occur on the feet, often on the soles, the toe webs, and around or under the toenails. A small, inflammatory papule with a central black dot forms early. Within the next few weeks, the papule slowly enlarges into a white, pea-sized nodule with well-defined borders between 4-10mm in diameter. This lesion can range from asymptomatic to pruritic to extremely painful. Multiple/severe infestations may result in a cluster of nodules with a honeycomb appearance. Heavy infestations may lead to severe inflammation, ulceration, and fibrosis. 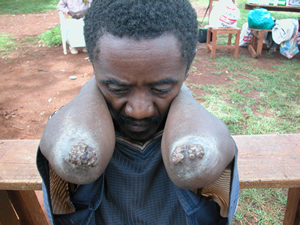 Lymphangitis, gangrene, sepsis, the loss of toenails, autoamputation of the digits, and death may also occur. In most cases, however, this lesion heals without further complications. Nonetheless, the risk of secondary infection is high. 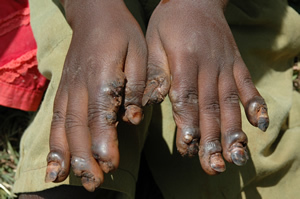 Tetanus is a common secondary infection that has reported associations with death. The sand flea is normally found in the sandy terrain of warm, dry climates. It prefers deserts, beaches, stables, stock farms, and the soil and dust close to farms. While both male and female sand fleas intermittently feed on their warm-blooded hosts, it is the pregnant female flea that burrows into the skin of the host and causes the cutaneous lesion. She does not have any specialized burrowing organs; rather, she simply attaches to the skin by her anchoring mouth and claws violently into the epidermis. Since this process is painless, it is thought that the flea may release some keratolytic enzymes. After penetrating the stratum corneum, the flea burrows to the stratum granulosum, leaving her posterior end exposed. 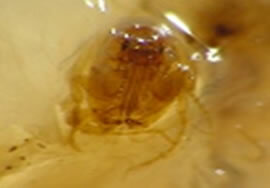 The "black dot" of the nodule is this posterior end of the flea sticking out. The opening provides the flea with air and an exit route for feces and eggs. With its head in the dermis, the flea begins to feed on the host's blood and enlarges up to 1cm in diameter. Over the next two weeks, over 100 eggs are released through the exposed opening and fall to the ground. The flea then dies and is slowly sloughed by the host's skin. The eggs hatch on the ground in 3-4 days. In the next 3-4 weeks, they go through their larval and pupal stages and become adults. The complete life cycle of a Tunga penetrans lasts about a month. An infestation begins to irritate and itch when is almost fully developed. Sometimes it causes severe inflammation and ulceration. If the female flea dies in the skin, it may cause a secondary infection which, if ignored, could lead to tetanus, gangrene and even loss of a toe. 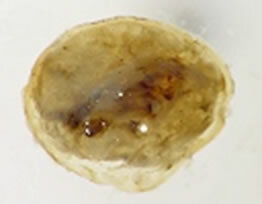 Natural extrusion of the eggs sac or removal of the jigger with a dirty pin or needle leaves a tiny pit in the skin which may develop into a sore. The sore may extend and develop into a septic ulcer. An infection under a toenail may cause pus to form. The major cause, after this research was discovered to be poor hygiene conditions. 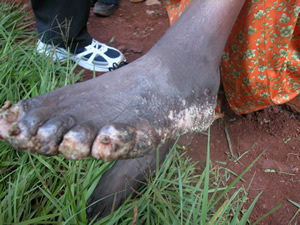 • Infections such as HIV/Aids are passed from person to person due to sharing of pins and needles while removing jiggers. 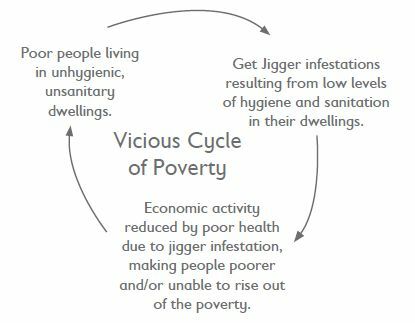 Another noted problem that may be caused by jigger infestation is the risk of passing on blood transmitted infections such as HIV / AIDS by use of unsterilised equipment to remove the bugs from different people. 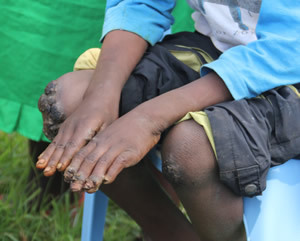 It was noted that many people share a single pin to extract jiggers - this is a situation that exposes individuals to the infection of HIV from those who already have the virus. • Dry the cleaned areas. • Soak affected area in a potassium permanganate or disinfectant for 15 minutes. • Apply petroleum jelly or other oil to soften the skin. • Repeat the above procedure three times a day for two weeks. For a complete eradication of the bug, their homes should be thoroughly fumigated and any animals that also have the fleas treated. To ensure that the home is bug free, the victim and the rest of the family have to be educated on the need to observe hygiene and ensure that the bugs do not find a home in their homes again. The prime preventive measure of the jigger is observing cleanliness. Wearing of shoes should also be encouraged to ensure that the flea does not find entry into ones feet. 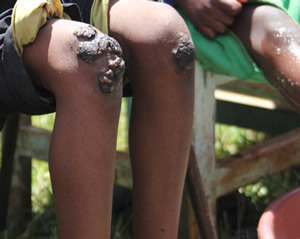 In infested areas, people should check their feet daily for freshly burrowing jiggers, which are visible as minute black spots and cause an itchy sensation. The fleas may also be deterred by a repellant applied to the skin, although walking barefoot in dirt quickly removes it. 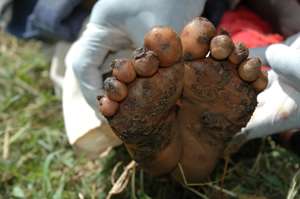 If it is possible to locate the area of soil where jiggers originate, it could be burnt off or sprayed with a suitable insecticide in an effort to kill the fleas.